I finally finished the 1000W xenon searchlight project that I started earlier this year. The power supply is a slightly modified arc welder coupled with an automotive ignition coil for the starting pulse. 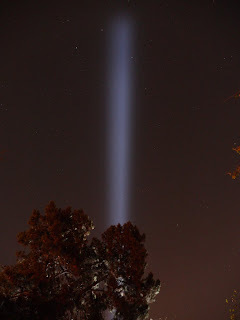 This is the searchlight's beam shooting skyward behind a large pine tree in my back yard. The beam is very difficult to capture on video. I am trying to develop a low-cost DIY thermal imaging device. The commercially available thermal imaging cameras still cost well over $1000 because of high production costs and low demand. Many hobbyists would like to have a cheap thermal imaging camera even if performance is not as good as commercial or military units. My goal is to build such a camera. In this video, I am testing one possible approach: Using a very thin projection screen that is painted with thermochromic liquid crystals. These liquid crystals change color in the temperature range 77*F to 86*F. Ideally, the projection screen housing would be heated (or cooled) to 77*F, so that all incident thermal radiation would raise the screen temperature higher than this, and immediately cause a color change.